We’d love your help. Let us know what’s wrong with this preview of Hamlet's BlackBerry by William Powers. To ask other readers questions about Hamlet's BlackBerry, please sign up. This is not a bad book for the right person. Hamlet's BlackBerry presents William Powers's case that we all need to unplug and allow for the pauses in our lives that are necessary to truly appreciate our relationships, our private selves, and our imaginations. After spending what, for me, is an unnecessary amount of time presenting an argument that quickly becomes redundant, he moves into a more interesting (but fairly surface) look at how new technologies throughout hist This is not a bad book for the right person. Hamlet's BlackBerry presents William Powers's case that we all need to unplug and allow for the pauses in our lives that are necessary to truly appreciate our relationships, our private selves, and our imaginations. After spending what, for me, is an unnecessary amount of time presenting an argument that quickly becomes redundant, he moves into a more interesting (but fairly surface) look at how new technologies throughout history have altered the way society, and thus the individual, functions. So, what was my issue with the book overall? Mainly that I'm already a lukewarm Luddite. I'm not naive enough to say that I can or will eschew all technology. There are too many advantages to simply swear off everything that is new and exciting in the realm of technology. However, I think I approach it with an awareness that many forms of technology actually make my life more stressful by making more work or filling my life with more noise. In short, give me technology that makes my life better and easier . . . and the better and easier it makes my life, the less I should be aware of it. So, Powers is preaching to the choir with me, something that is certainly not his fault and his book would be a better fit for someone who is only beginning to suspect that his life might be better with more "unplugged" moments and need some coaxing to wean himself off of his iPhone's teat. 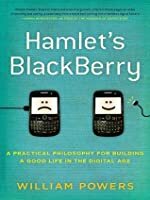 Like so many non-fiction books, Hamlet's BlackBerry is often unnecessarily repetitious and the history sections, while interesting (especially the early chapters which focus on what a threat intellectuals perceived writing and books to be), offer vague support for his argument. This could have been an excellent magazine article or newspaper series, but it's not quite meant for book length form. Also, after reading Nicholas Carr's superior The Shallows, which broaches the issue of how technology can actually rewire our brains and cause us to become "shallow" thinkers, Power's thesis seems simplistic by contrast. However, if you haven't read The Shallows, then wading into the "less technology is more" argument with Powers may be ideal and Powers's message is probably better suited to people who are less concerned with neuroplasticity than with the need to "Simplify, simplify." Hamlet's BlackBerry disappointed me. The Shallows: What the Internet is Doing to Our Brains is a more detailed, better written, and more convincing description of "information overload" and how current electronic media affect our minds and our lives. Having spent the first part of the book describing the problem, Powers sets up the second part to be a tour through the ideas and philosophies of seven great thinkers, from Plato to Benjamin Franklin, each with advice to offer on establishing a balan Hamlet's BlackBerry disappointed me. The Shallows: What the Internet is Doing to Our Brains is a more detailed, better written, and more convincing description of "information overload" and how current electronic media affect our minds and our lives. If nothing else, this book affirmed me. I don't blog, I don't do Facebook or Twitter. I don't own an iAnything (pod, pad, phone). My cell phone is just that-- a phone. No internet capabilities, save a computer at home. And I'm perfectly fine with all of it, thank you very much. Powers takes our society's massive obsession/addiction to "being connected" down to its core: the fact that we have to "accept our fundamental separateness from others. Happiness is about knowing how to enjoy one's own compa If nothing else, this book affirmed me. Powers takes our society's massive obsession/addiction to "being connected" down to its core: the fact that we have to "accept our fundamental separateness from others. Happiness is about knowing how to enjoy one's own company." For me, that sums up the whole book. Being a loner, this was not difficult for me to grasp. Every year I take an "away" for several days to a quiet cabin. No television. No internet. No telephone. I'm even hesitant to bring any sort of music, for fear I'll miss out on the "real sounds" of life around me. The ducks and geese on the lake. The birds greeting the morning. The random skittering of animals through the brush. The wind. Based on the number of holds placed on this book from my library, there are others questioning their constant connectedness. And I know there are even types of software you can buy and download which will block your internet-- so you might actually get something productive done. I felt like it could have been a good deal shorter (it seemed repetitive ... but then again, I already knew what he was talking about). Powers writes regarding the need for balance between our digital and "inner" lives in order to achieve "depth." His ideas are loose, not well defined, but he makes some good points. Essentially an article padded to book length. This book made some fantastic points, but in many cases I thought it was repetitive and slow. If it had been edited down to something a bit more concise, I would have enjoyed it more. What I appreciated most about this book was the way Powers points to history and literature to illustrate the problems and solutions we currently face in the "digital age". Ever thought about how distressing the arrival of the written word must have been to a previously oral culture? Even the ancients had to find wa This book made some fantastic points, but in many cases I thought it was repetitive and slow. If it had been edited down to something a bit more concise, I would have enjoyed it more. Ever thought about how distressing the arrival of the written word must have been to a previously oral culture? Even the ancients had to find ways to deal with the pressing demands of new technologies. Google may be making us stupid, but Socrates thought that writing was making the people every bit as stupid. Who, after all, needs to commit anything to memory anymore when we have the ability to just write it down and refer to it again later? Powers does a terrific job of showing how each new development in communications technology (be it writing, the printing press, the telegraph, television, or the internet) has presented society with its own set of benefits and drawbacks, and that in every instance people have had the option of either using or being used by those technologies. Our situation is nothing new. The question of how to build a good life—in a digital age, or in any other age, for that matter—is well worth asking, but I found Powers's solution somewhat unsatisfying. I wished he had given far more emphasis to the importance of physical presence as an antidote to the onslaught of digital presence in our high-tech lives. The idea of an internet sabbath, however, is terrific. Blessed are thee to have friends who send emails, IMs, FB messages and text messages. Yet with it comes the feeling that you have to constantly check them to keep connected. If you ever feel even slightly overwhelmed by it all, this book will make you realize that this is not just a 21st Century problem. It goes back as far as Plato (with the written word), Gutenberg (with the printed word), Shakespeare (with handheld devices - read the book to understand what "tables" are), Thoreau (with rail an Blessed are thee to have friends who send emails, IMs, FB messages and text messages. If you ever feel even slightly overwhelmed by it all, this book will make you realize that this is not just a 21st Century problem. It goes back as far as Plato (with the written word), Gutenberg (with the printed word), Shakespeare (with handheld devices - read the book to understand what "tables" are), Thoreau (with rail and electricity connecting people), and other historical figures. As he describes, "If you spend most of your time pressing keys and managing electronic traffic, that's what your life will be about. Maybe that makes you happy. If not, you have other options." My job consists of staring at screens (W. Powers defines screen as computers, mobile phones, ereaders, etc.). Taking a break by reading this book put my life a bit more into perspective. The nice thing is that W. Powers sees the good too. "The point isn't that the screen is bad. The screen is, in fact, very good. The point is the lack of proportion...We were living for the screen and through the screen, rather than for and through each other." And he offers some possible solutions. This book was a very thoughtful Xmas gift from someone I work with. I've had an email account since 1984 and a cell phone since 1994, but I've never really thought that hard or systematically about what being connected electronically means to my life. I've always gone with the flow and upgraded to the latest gadgets, assuming that more features and more connectivity is unquestionably a good thing. This book is important because it provides a set of mental constructs and historical reference points This book was a very thoughtful Xmas gift from someone I work with. Each of the seven philosophers (probably slightly dumbed down and taken slightly out of context) neatly illustrates a concept related to the exigencies of the screens that dominate our lives so. And by isolating and describing these concepts, Mr. Powers gives us a fingernail hold on our relationship with the Internet that we can use if we ever decide to pull it apart and examine it. So now I'll have something to think about as I wait in line for the next version of the iPhone. But don't get me wrong. It's very nice that I no longer need to trudge across campus (in the snow and uphill both ways) to check whether anyone replied to one of my reviews on rec.arts.books like I did back in the late 80s. Now I get a Goodreads email alert sent straight to my phone. It's awesome. A few quibbles about the book: I don't think it needs to be as long as it is. There is a lot of repetition, especially stating the same points multiple times. Maybe he's assuming his audience is so Internet-addled that he needs to write as if for a teenager with ADD. It definitely helps with the retention, but it made me feel impatient. I'm a big boy. I can read grown up books. Also, I think some of the history might need to be fact checked. I'm not an expert, but there will little things like St. Augstine being in Italy (wasn't he in North Africa?) that struck me as minor errors, but not enough to make me get my phone out to fact check them. A third quibble is that some of the "solutions" aren't as ground breaking as Mr. Powers makes them seem. Maybe I'm just more savvy but doing things like going full screen and closing extra tabs is sort of a no duh suggestion. (The focused writing mode feature on Word is worth the price of Office alone.) One last thing: there is an introduction/prologue thingie written in the second person and I hate stuff written in the second person. As you read this review, how many other programs are open on your computer? Your email, perhaps, and possibly the Library’s catalog, and probably there’s a Google search box just a click away. Is your mobile phone (how smart is it?) nearby, maybe on your belt or in your pocket, with you alert to the next beep or vibration signaling an incoming message? And if any part of this is true, does it make you happy or does it cause a little distraction, maybe even a little stress? Hamlet’s BlackBerry dis As you read this review, how many other programs are open on your computer? Your email, perhaps, and possibly the Library’s catalog, and probably there’s a Google search box just a click away. Is your mobile phone (how smart is it?) nearby, maybe on your belt or in your pocket, with you alert to the next beep or vibration signaling an incoming message? And if any part of this is true, does it make you happy or does it cause a little distraction, maybe even a little stress? Hamlet’s BlackBerry discusses the paradox of our plugged-in lives. Multiple gadgets promise to keep us more connected than ever, and yet the ever-present demands on our attention that are facilitated by these gadgets remove some of our ability to concentrate on any one task or appreciate conversations with more depth. Author William Powers is no Luddite and appreciates the enhancements that computer and communication technologies have brought to our homes and workplaces. But he also laments the growing superficiality of much of what we do, hopping from email to the web to tweets. Yes, thanks to Facebook, you know what your best friend back in fourth grade had for breakfast today, but…why should we be spending our time and energy to learn that? Powers provides a historical perspective of the revolutionary changes in how people communicate and the threats such changes brought to meaningful thought and relationships. Plato, Seneca, Gutenberg, Shakespeare, Ben Franklin, Thoreau and McLuhan all get a chapter, and each had a way to cope with the intrusions of their day. Hamlet’s BlackBerry was a pocket-sized book with specially coated pages that could be erased with a sponge. It was used in Shakespeare’s time to scribble notes on as people went about their busy days. Powers offers strategies to use the tools of our age to make work more efficient and correspondence more immediate, but also to know when to put down those tools and turn them off, in order to slow down, concentrate, and deepen our experiences. Do our electronic devices serve us or do we serve them? I've been asking this question for some years and have felt it was more the latter than the former. "Hamlet's BlackBerry" details how this question has been asked for over 2,000 years. If there is any doubt that there is a problem, let's take this quote from the book regarding regaining focus on a task when one has been interrupted: "By some estimates, recovering focus can take ten to twenty times the length of the interruption. So a one-min Do our electronic devices serve us or do we serve them? I've been asking this question for some years and have felt it was more the latter than the former. "Hamlet's BlackBerry" details how this question has been asked for over 2,000 years. So every time I pull my attention away from writing a book to check e-mail or Facebook, it's not just the small distraction it appears. The author provides several analogous moments in Western history. For example, there is Thoreau's lament in "Walden": "But lo! men have become the tools of their tools ..." making reference to the always on information highway of his time, the telegraph. The end of the book offers suggestions on unplugging, on creating distance between ourselves and the digital world, giving ourselves space and time for inward reflection rather than being obsessed with outward communication. And as for what Shakespeare used as a "BlackBerry", you'll have to read the book to find out. I think this book is for older people. I couldn't bring myself to share Powers' anxiety about how connectivity has changed his life, because I've had a laptop since I was 12 and all of my adult apartments have had wi-fi... the degree of connectivity has changed in my lifetime, and I definitely remember a time before the internet, but I'm firmly in the generation that has grown up with email and I think I've grown up knowing how to swim in the sea of the internet without freaking out. I liked the I think this book is for older people. I couldn't bring myself to share Powers' anxiety about how connectivity has changed his life, because I've had a laptop since I was 12 and all of my adult apartments have had wi-fi... the degree of connectivity has changed in my lifetime, and I definitely remember a time before the internet, but I'm firmly in the generation that has grown up with email and I think I've grown up knowing how to swim in the sea of the internet without freaking out. I liked the first half, and found myself trying harder to leave my phone in my bag for my whole commute while I was reading it, and even on days when I wasn't. (And I like this plan - commute time as non-screen time) But he really lost me about halfway through when he started talking about Thoreau, who is decidedly not one of my kindred spirits. 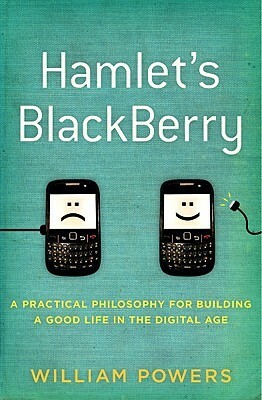 Sadly I find myself in the crosshairs of Hamlet's BlackBerry, a book which dissects modern society's fascination with connectedness and the toll it takes on our productivity and personal lives. William Powers' thesis is familiar to all smartphone-toting Westerners though he points out that the desire to escape the busyness of daily life is not new. Powers cleverly weaves the struggles and ideas of philosophers from Socrates to modern-day McLuhan in dealing with technological innovations that cha Sadly I find myself in the crosshairs of Hamlet's BlackBerry, a book which dissects modern society's fascination with connectedness and the toll it takes on our productivity and personal lives. William Powers' thesis is familiar to all smartphone-toting Westerners though he points out that the desire to escape the busyness of daily life is not new. Powers cleverly weaves the struggles and ideas of philosophers from Socrates to modern-day McLuhan in dealing with technological innovations that change communication. These include the written word, printing press, and devices we rely on today. An addict himself, Powers concludes with a few practical suggestions for maintaining a healthy balance between connectedness and nurturing the soul. Though crisply written, the text suffers from repetitiveness. I found myself wanting a more concise version of the intuitive concept. Lo and behold, it appears toward the end between pages 221-230. Further, some of Powers' conclusions are derived from stretched logic or gossamer ties to his anecdotes. Some good and practical advice in this book. I read it three or four years ago, and it's endlessly relevant. There are more things in heaven and earth, Powers argues, than are dreamt of in our digital philosophy. I agree completely, although, as others have noted, the author doth protest too much, methinks, for those of us who already suspect that our devices hath power to assume a pleasing shape. We needed more matter with less art. Yet, thanks to its catchy title and the eponymous chapter that explains it, there’s a special appeal in this critique of connectedness. Meet it is I set it down, with addi There are more things in heaven and earth, Powers argues, than are dreamt of in our digital philosophy. I agree completely, although, as others have noted, the author doth protest too much, methinks, for those of us who already suspect that our devices hath power to assume a pleasing shape. We needed more matter with less art. Yet, thanks to its catchy title and the eponymous chapter that explains it, there’s a special appeal in this critique of connectedness. Meet it is I set it down, with additional apologies to Shakespeare purists. Thus connectedness does make neurotics of us all; and thus the native hue of social interaction is sicklied o’er with the pale cast of LED backlighting. I've been feeling overwhelmed lately by the demands of the various online communities and social networking sites to which I belong. Well, not just lately; a few months ago, I actually did a major purge of Facebook, 'unfriending' everyone to whom I didn't feel I had a real connection. It was over 200 people, which boggles the mind. Two hundred people I had 'friended' just to, what? I wasn't sure. Which is why I cut them loose. I haven't missed a single one. But still, my digital, online life has I've been feeling overwhelmed lately by the demands of the various online communities and social networking sites to which I belong. Well, not just lately; a few months ago, I actually did a major purge of Facebook, 'unfriending' everyone to whom I didn't feel I had a real connection. It was over 200 people, which boggles the mind. Two hundred people I had 'friended' just to, what? I wasn't sure. Which is why I cut them loose. I haven't missed a single one. But still, my digital, online life has been taking up far too much of my time, so when I saw this book offered for review by Harper Perennial, I jumped at it. And I'm really glad I did. I was recommending this book before I'd even finished it. The first part of the book is about how connected we are, and how this is causing stress and other problems in our lives. Powers uses personal anecdotes as well as general stories to illustrate his points, using himself and his family as examples to bring home the impact of all the screens in our lives, as he puts it. Being connected is a good thing, he says, but it's taking over our existence. In part II, he explores seven thinkers and philosophers from history, from Plato to McLuhan, and how they dealt with changing technologies in their times. Being overwhelmed by the crowd, as new technologies bring them into our homes and lives, is nothing new. What's interesting is how they managed to integrate these technologies into their daily lives without letting them take over, and how that pertains to us now. Then, as now, there was often a backlash against new tech. An example Powers uses is the recent resurgence of the popularity of Moleskine notebooks (of which I am also a fan: I love carrying around a little notebook to write snippets in as I think of them). Something that would have been high tech a few hundred years ago is now retro cool, and that's a good thing. The last part of the book is about putting into practice ways to break away from the addiction to screens, both computers and smartphones. As an experiment, he and his family declare weekends to be Digital Sabbaths (something the Rowdy Kittens website calls Digital Sabbaticals), when the modem is unplugged and mobile phones turned off. It takes them a while to get used to it, but eventually it's something they all look forward to, and it makes them closer as a family. This is something I'd like to put into practice myself: make at least one day per week a connection-free day, and not go online at all. I spend far too much time checking Facebook, Twitter, LiveJournal, and now Google+ multiple times per day. And I don't even have a smartphone! It would be ten times worse, I'm sure, if I did. And yet, I still want one. I find it annoying when people I'm with keep checking their phones, yet would I be like that if I had one? Probably. I do make a conscious effort to step away from the computer when I'm at home, going out for walks or into the living room to read or write (on paper, with a pen, even!). But as soon as I get home, or finish a chapter, I'm back at the screen, checking email or what have you. It truly is an addiction. I feel like this book has given me the tools to break that addiction, or at least manage it. Powers attempts to explain the sensation that there's something wrong with the fact that there's so much communication technology in use nowadays appears. He believes that there is indeed a problem that needs to be addressed, and believes that it's possible to address it by paying attention to philosophers or other prominent thought leaders of the past. This historicising approach has its benefits. For one, it conveys that the nature of the issues faced in contemporary society are not new: they'v Powers attempts to explain the sensation that there's something wrong with the fact that there's so much communication technology in use nowadays appears. He believes that there is indeed a problem that needs to be addressed, and believes that it's possible to address it by paying attention to philosophers or other prominent thought leaders of the past. This historicising approach has its benefits. For one, it conveys that the nature of the issues faced in contemporary society are not new: they've been experienced before, and they've been addressed before. Powers chose his philosophers - Plato, Seneca, Gutenberg, Shakespeare, Franklin, Thoreau, McLuhan - based on the attitudes they expressed about the communications technology and the society of their era, in an attempt to show how the solutions of the past could be applied to the problems of the present. Ultimately, though, I think the effort runs into trouble by vastly oversimplifying the problems and issues involved. The problem for Powers is "screens" and how so many of us now choose to spend so much time connected to them instead of to "real" experience. He does suggest that this behaviour could stem from a contemporary ideology which claims, as he puts it, that more connectedness is always better. The nature of the problem is a lack of time devoted to "inner life". The entire issue of the possible advantages and disadvantages of communications technologies is reduced to the question of whether the technologies themselves provide the right balance of time spent alone versus time spent "in the crowd". Such an issue is important, but it can't be blamed entirely on the technology, and it surely isn't the only ethical issue to consider. Powers also explicitly rejects technical solutions to this screen-induced problem of constant distraction. He claims instead that the solution must be philosophical: it requires thinking about the problem and coming up with changes to one's own lifestyle in order to have a healthier relationship with technology. The specific suggestions supplied in each chapter form the core of are book. The suggestions are quite comprehensible, and sound quite straightforward to implement. However, Powers at no point considers that such behaviours, if undertaken by someone who isn't a comfortably middle-class professional write, might have tremendous opportunity costs. In Germany, for instance, there has been a recent push to ban employers from emailing employees outside of business hours. This is an extremely good move, entirely in keeping with what Powers would want, but there's simply no way that the employees could achieve this ban merely by changing their own behaviour. It was a social solution to a social problem, not a personal solution for a personal problem. This is one of those sociological books that my cerebral self really enjoyed. First of all, Powers addresses a problems I struggle with every day. How much technology is too much? My answer has mostly been that too much is when it takes too long to figure it out. Like spending 45 minutes putting parental controls and taking off the app store of the ipod so my credit card will stop taking a hit. Like when we got a new DVR and I can't figure out how to cancel recordings so I simply gave up watchin This is one of those sociological books that my cerebral self really enjoyed. First of all, Powers addresses a problems I struggle with every day. How much technology is too much? My answer has mostly been that too much is when it takes too long to figure it out. Like spending 45 minutes putting parental controls and taking off the app store of the ipod so my credit card will stop taking a hit. Like when we got a new DVR and I can't figure out how to cancel recordings so I simply gave up watching TV. Conversely, how much time have I invested into understanding html or ignored my children while I had a very important email to read or write or blog post to pound out (none of which I can remember, anymore)? More than I care to admit. In fact, Powers quotes a Google executive giving a commencement speech where he exhorts the new graduates to turn off the computer and play with a child. What Powers contends is that we are missing "gaps" in our lives. The time between profound moments to process, make sense, and develop depth. We move from one activity to another, toggling as quickly as we can without taking the time to reflect and develop meaning from life. The author then uses experiences from his own life and provides philosophical examples from pivotal moments of information in the past like Plato telling a story about leaving the city behind to think or Guttenberg's moveable type machines and the way reading aloud to reading silently changed thinking processes, Shakespeare's Hamlet using a fourteenth century ipad, etc. I found each example to be incredibly intriguing and presented new information or information presented in a way I'd not considered. This is not a book to read while surrounded by technology or other people to distract the reader. Although not difficult to understand and easy language, the ideas require the reader to have "gaps" to absorb it. Ultimately, I still struggle with the question of technology. On the other hand, my best example is that of my dad. No matter what he was listening to on the radio, watching on the television, reading in a book or newspaper, when I spoke he turned off the radio, television or closed the book until we were finished talking. Nothing on t.v. or the radio was more important than I was. This is an extremely important and valuable book, if for no other reason than to confirm to me that I am *not* crazy, that our headlong rush into more and more digital connectedness is not necessarily a good thing--it's confirmation of my feelings these last few years. And like the author, I'm not an anti-techie. I LIKE having a cell phone and email. When used in the proper proportions, I think the digital world does enhance my life. But there is a point past which it makes me crazy instead. And This is an extremely important and valuable book, if for no other reason than to confirm to me that I am *not* crazy, that our headlong rush into more and more digital connectedness is not necessarily a good thing--it's confirmation of my feelings these last few years. And like the author, I'm not an anti-techie. I LIKE having a cell phone and email. When used in the proper proportions, I think the digital world does enhance my life. But there is a point past which it makes me crazy instead. And this book is important validation for WHY and then, for WHAT to do about it. I never knew, sometimes, why I was feeling so uncomfortable. I would make a brief foray into some new digital adventure because "everyone is doing it" and then, when I felt only stressed and not happy, I'd pull back and leave, and take my lumps from people around me who could not understand my decision at all. I actually got hateful comments when I "resigned" from the blogosphere after a year-long experiment. And when I briefly joined Facebook, and then quit, I had people genuinely puzzled. "But how can ANYONE not like Facebook?????" Now I know--I was just needing more "alpha" and less "omega" to keep the balance in my life. In addition to persuasively identifying the problem of the downfalls of too much connectivity in our lives, and how stressed it can leave us, Powers then takes us on a thoughtful tour through history to learn from the adaptations of other men in other times who've had to adjust to a new technology. My kids did not like this part of the book best, but I really enjoyed it--I think there was a lot of value to learn. And I really appreciated that Powers gave us examples of things to do to find spaces in our lives for non-connectedness, rather than give us "prescriptions" I think he is absolutely right that we have to decide on our own boundaries ourselves, and not have it imposed on us from outside. First off, I'll admit. This book fell plague to a weird thing that happens to non-fiction books that I read. I'll call it the start/stop scenario. Not the books fault, but it didn't grip me enough to rip through (and then bookclub books had to take it's place). So I'd start, get moving, and then stop. This also happens when I find that a book has quite a bit to ponder. Meaning, I don't want to RIP through it, because that would defeat the purpose of learning and processing the information. So I s First off, I'll admit. This book fell plague to a weird thing that happens to non-fiction books that I read. I'll call it the start/stop scenario. Not the books fault, but it didn't grip me enough to rip through (and then bookclub books had to take it's place). So I'd start, get moving, and then stop. So I started this one last year, picked it up again near the end of winter, and finished it now. I will definitely say that I never felt lost when I picked it back up, because the topic is very current and is already something I often think about. The author's analysis wasn't necessarily breakthrough, but the book did offer up a lot of good thinking points about the way we let technology run rampant through our lives. It made the valid points that our generation isn't the first, or the last, to be plagued with these issues. And it offered concrete ways in which we can take various elements of our lives back for ourselves and use technology to our advantage, instead of being slaves to it. I'm glad I'm not the only one thinking about these things. "We've effectively been living by a philosophy, albeit an unconscious one. It holds that (1) connecting via screens is good, and (2) the more you connect, the better. I call it Digital Maximalism, because the goal is maximum screen time. Few of us have decided this is a wise approach to life, but let's face it, this is how we have been living." "Digital busyness is the enemy of depth." "Part of what drives us back to the screen may be evolutionary programming. The human brain is wired t Great read! "Part of what drives us back to the screen may be evolutionary programming. The human brain is wired to detect and respond to new stimuli. When we become aware of some novel event or object in our surroundings, the brain's "reward system" is activated..."
"It is not the man who has too little who is poor, but the one who hankers after more." I enjoyed reading this book -- although I really kind of skimmed some of the chapters. I enjoyed the connections Powers makes between classical philosophers and current concerns about how we use technology. The chapter on Thoreau was especially interesting since I read Walden every year with my high school students. It was a great way to make Thoreau more relevant to them. I think this is a book I will dip back into over time. Just took this out from the library -- there was a big waiting list! I heard William Powers on NPR talking about his family making the shift to an electronics free weekend. Hmmmmm. I need a button for skimmed. The author says it all in his marvelous on-air interviews. When I got right down to it, it was one family's experience: interesting, thought-provoking but not what I expected. It fell short, for me, of the "voice" I had heard. Expected more, mostly light and fluffy, an easy read, some fascinating trivia at times, lots of unnecessary waffle, occasionally some flashes of brilliance, the chapter on "a cooler self " / McLuhan etc was particularly good IMO . On the surface this book may seem simplistic, but it's a great set of meditations on the effect of constant internet connection on human beings. I recommend it for anyone who, like me, works primarily on the internet. I'm recommending it for my online students as well.